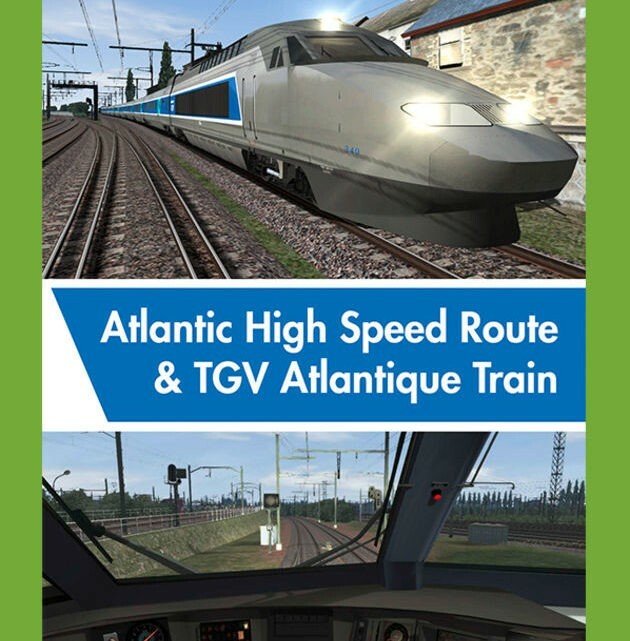 Experience the high speed TGV Atlantique on the 220km Atlantic High Speed route running south-west from Paris Montparnasse to St-Pierre-des-Corps station in Tours, passing through the two high speed stations at Massy-TGV and Vendome-TGV. As you travel at up to 300 km/h you will pass through the beautiful landscape to the south-west of Paris. The Quick Drive enabled route includes numerous custom and animated objects and also winter textures. Expansive freight yards, engine workshops and depots are included. Ten Standard scenarios and four Free Roams are also included. The included TGV trains, supplied in several liveries, have the in-cab TVM signalling system to allow running at up to 300 km/h and are supplied in several authentic consists. The TGV has an authentic start-up procedure, dual-voltage pantograph operation, cruise control, operating nose covers and custom sounds and passenger views. Trains leave Montparnasse station and pass through the southern suburbs of Paris, partly underground beneath the ‘Coulée Verte’. At this point the route follows the old Paris-Chartres line. After Massy TGV station at PK 14 (‘Point Kilométrique’, or Kilometre Point) trains pass through the Villejust tunnel, reaching a speed of 300 km/h at the tunnel exit, and the route then follows the A10 motorway. The route curves south near the Saint-Arnoult toll and passes over the A10, briefly following the non-electrified single-track Brétigny-Tours line from Dourdan – La Forêt station. The fork between the western branch (in the direction of Rennes and Le Mans) and the south-western branch (towards Tours) is at PK 130 in Courtalain. After Courtalain the line heads due south in the direction of the Vallée du Loir. Vendôme TGV station at PK 162 is situated shortly before the section of the route at PK 166.8 where the world speed record had been set in 1990. The line then enters Indre-et-Loire, crosses over the A10 and begins its descent towards the Loire valley. After the Vouvray tunnel (1,496 metres) comes a succession of three viaducts across the Loire, almost a kilometre long in total, and the line then arrives at Saint-Pierre-des-Corps station at PK 233. The route is equipped with B.A.L. (‘Bloc Automatique Lumineux’) light signals on the standard (i.e. not High Speed) section and TVM-300 cab signalling on the High Speed section of the route where the higher speeds make it difficult for the driver to accurately see trackside light signals. Indications of zones where the pantograph must be lowered and raised. High speed routes on the TGV/Thalys/Eurostar network are equipped with a system of beacons which transmit signals directly to the driver’s cab, where they are displayed as part of the train controls. The signalling information is transmitted through the rails as electrical signals which are picked up by antennae placed under the train. This TVM system (Transmission Voie-Machine or ‘track to train transmission’) is a fixed block system, i.e. the track is subdivided into fixed segments, each of which has a particular state. The TGV Atlantique was built from 1988 until 1992 by GEC-ALSTHOM and is in operation on the Atlantic line serving the west and southwest of France. The locomotives are equipped with the TVM-300 in-cab signalling system and are numbered 301 – 405. Includes the current and older style of liveries as well as an overhead wire control coach. 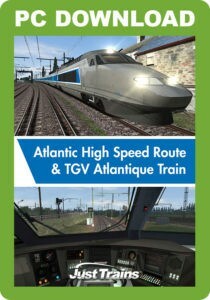 Learn to drive the Atlantic TGV. Good evening. You are to drive your train from Vendôme to Massy TGV. The overhead wires control coach is in your train consist. Good morning! At the start of your day you have to drive your train from the Chatillon workshop to Paris Montparnasse station, then pick up your passengers and drive south to Vendôme TGV. Drive from Paris to St-Pierre-des-Corps with a stop at Vendôme station. Take command of your TGV for a local service to get some line experience, especially as regards slowing the train to stop correctly at stations. You will stop at Massy TGV, Vendôme TGV and finally arrive at St-Pierre-des-Corps. It’s midday and you will drive north from St-Pierre-des-Corps direct to Paris. Have a good trip! Take control of the outbound TGV from Tours to Paris. You are at Vendôme station in charge of the 325 TGV, the famous record breaking train, and you’ll experience 350 km/h during the testing of the train. You will need to stop at Chatillon before continuing to Paris Montparnasse station. A simple trip south from Vendôme TGV to St-Pierre-des-Corps. A TGV is down shortly before Vendôme. You must dock it, after you have opened the nose coupler covers (CTRL+Y) and then push it up to Vendôme. Note: If you purchased Train Simulator after 20 September 2012 you will require the European Loco & Asset Pack – available to purchase via Steam – for the route to display correctly.